Send your clients off with these beautiful travel kits by June Jacobs! Don't let your clients leave home for a winter vacation without their skincare! 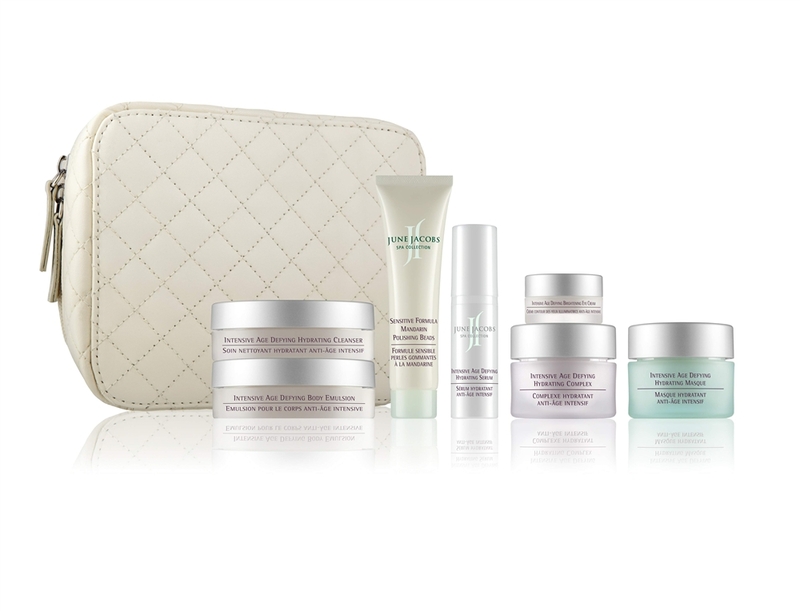 These kits include a wide variety of treatments that will keep their complexion glowing long after they leave your spa. The Intensive Age Defying Travel Kit is perfect for that client looking to bring that youthful glow back into their skin!The seven piece kit includes a collection of paraben and preservative free age defying treatments with a powerful patent pending anti-oxidant blend of white, red and green tea extracts combined with goji berry, pomegranate and grape seed extracts to help neutralize free radicals, protect skin from environmental toxins and combat the signs of premature aging. Skin care is just as important to men, as it is for women! 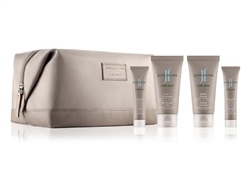 Don't forget to send your male clients out into the world with this stylish kit. Paraben and preservative free, this four piece collection of men's skin care products with pine bark extract helps reduce skin redness and irritation associated with men's grooming. Pamper your clients by bringing the spa experience into the comfort of their own home, or while on vacation with these luxurious hair and body products! Vanda Orchid Polishing Beads, Papaya Body Balm, Grapefruit Purifying Shower Gel, Citrus Clarifying Shampoo, Citrus Clarifying Conditioner. All kits are conveniently packaged in travel safe sizes with a deluxe travel case! Nowadays women aren't the only ones concerned about skincare. With all the mens products coming out from high end lines, men to are paying more attention to the health and look of their skin and are also visiting the salons and spas more often than you think. June Jacobs has come out with a great line for men you can offer to your male clients. The line includes a 3 in 1 Cleanser, Exfoliating Scrub, Shave Cream, and Lightweight Lotion. Used regularly, they will notice a difference in the look and feel of their skin, looking clearer and feeling softer then ever. These products contain Pine Bark Extract, which is an anti-oxidant that helps reduce redness and irritation associated with mens grooming. The line is paraben and preservative free and has a powerful patent pending anti-oxidant blend of white, red, and green tea extracts combined with goji berry, pomegranate and grape seed extracts to help neutralize free radicals, protect skin from environmental toxins and combat the visible signs of premature aging. (Men worry about aging too!). Oh, and they also smell great and do not have an over-powering scent. A travel kit is also available for men on the go! This convenient kit includes smaller sizes of all four products in a deluxe travel case. Check out the travel kit here! These items are also available in professional sizes. Your male clients will thank you for making this line available to them! 3 in 1 Cleanser - Apply a small amount of cleanser onto dampened skin and/or hair. Rinse thoroughly with water and pat dry. Exfoliating Scrub - After cleansing, apply a small amount of scrub and add water. Massage in a circular motion concentrating on areas of congestion. Rinse with water and pat dry. Follow with Lightweight Lotion and sunscreen. Lightweight Lotion - Apply twice daily after cleanser by gently massaging into face and neck. Follow with sunscreen. Shave Cream - Apply a thin layer to dampened skin. Shave. Rinse. Follow with lightweight Lotion and/or sunscreen. Check out all of our products by June Jacobs Spa Collection!